America’s first National Scenic Highway passes right through our back yard. We took a drive along parts of the North Cascade Loop to take in some new sights, test out new photography gear, and satisfy an urge to take the CC out and put it through it’s paces! We took Highway 20 East-bound towards Winthrop and drove through Rockport after passing Oso, White Horse, and Darrington along Highway 530. Once we were past the construction zones that stopped us in our tracks we blasted through the twisting roads of the North Cascade Highway, stopping occasionally to take pictures at one of the many scenic spots along the way. 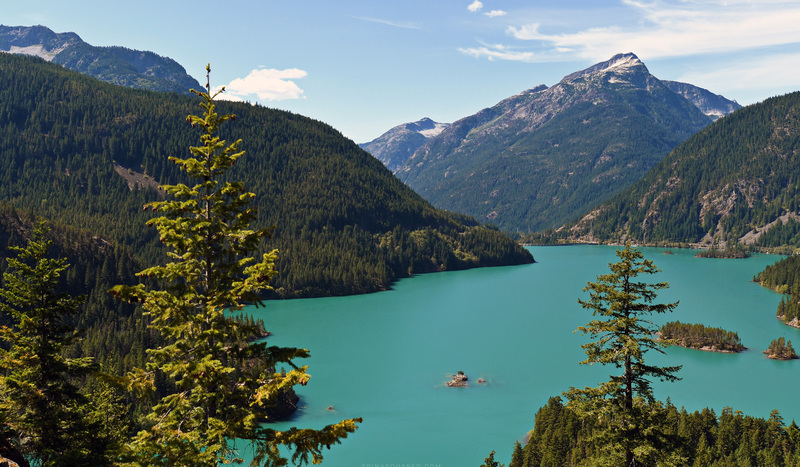 Nestled in between Ross Lake and Gorge Lake and surrounded by Davis Peak, Ruby Mountain, and Pinnacle Peak is Diablo Lake – a reservoir created by Diablo Dam that sits at 1,201 feet above sea level. The lake gives off a brilliant, turquoise hue as the sun reflects on glacier-ground rock dust suspended in the water. After having seen some amazing images of Diablo Lake online we had to go check it out ourselves. We took in breathtaking, panoramic views of the reservoir and surrounding mountains from the Lake Diablo Vista Point before heading back for home. On our way back we wanted to check out that water up close and with temperatures reaching 90-degrees that day a splash from the ice cold lake felt absolutely refreshing! With so much more yet to explore out there we can almost guarantee this won’t be our last trip on the North Cascade Highway! These photos are amazing! I’ll be visiting Lake Diablo soon, can’t wait!